PORTLAND, Maine — Gov. Paul LePage said Thursday that while Maine has been eyed by Asian companies as a potential factory site, the state’s high energy costs have proven a deterrent. Particularly after the tsunami that hit Japan earlier this year, Japanese and South Korean automakers have been looking for other locations for plants to geographically diversify their holdings, LePage said to about 500 people gathered at the Portland Regional Chamber’s Eggs and Issues event. LePage used the Portland event to talk about some of the initiatives his administration worked on in the last year and to look forward to future goals — including lowering Maine’s energy costs. LePage said the state’s energy rates are 42 percent higher than the national average, the 12th highest in the nation, though lowest in New England. “My administration cares about one thing — to find the most efficient and affordable energy for the people of the state of Maine so that we can heat our homes [and] provide energy needed in business places,” said LePage. He talked about his plan to expand natural gas in Maine as a heating source. He noted that the Woodland pulp mill in Down East Maine is converting to natural gas and expects to drop energy costs by $10 million. His administration is working with natural gas companies to see if they will expand pipelines in Maine. State government needs to find incentives to have people connect up to those pipelines, he said. Natural gas is distributed both to companies and individual homeowners in some parts of the state. Unitel serves the Portland area, Lewiston and Auburn and Kittery. Bangor Gas serves parts of Bangor, Brewer, Orono, Old Town and Veazie. Maine Natural Gas serves parts of Windham, Gorham, Bowdoin, Topsham and Brunswick. He said he plans in January to introduce a “very controversial” bill to eliminate income taxes on retirees’ pensions. Maine Revenue Services estimates that the move would cost $93 million and reduce taxes for 75,000 people. He said a streamlining tax force and the use of zero-based budgeting should be able to find about $100 million in state government cuts. 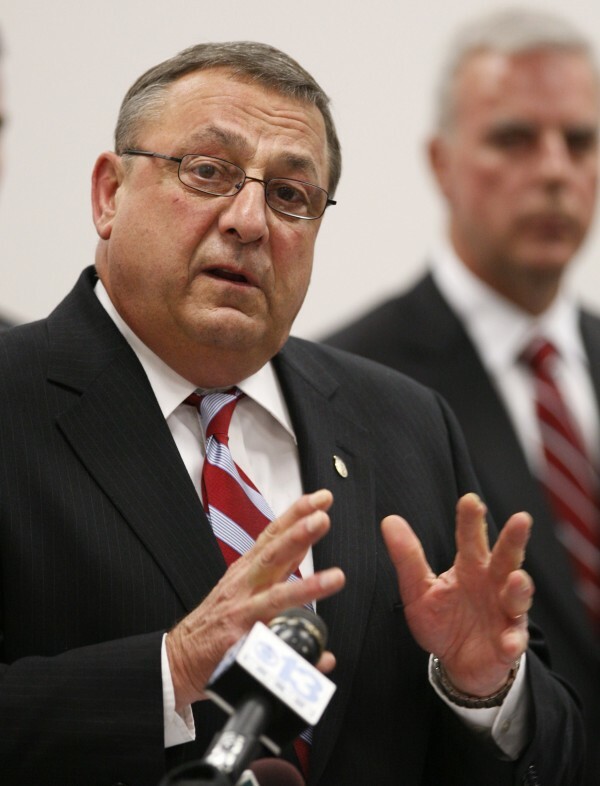 “I do not believe that we have the right as a government to take all of your money — we have the legal authority to take enough money to run government efficiently,” said LePage. Those cuts, he said, would follow the $400 million in tax reduction from a package passed in the last session, he said. He said the economy was stalled because of national and global problems. Fixing things at the local level entails cutting government spending and reducing taxes on business, he said. “What we need to do is lower spending of the public sector and try to move as many resources to the private sector so the private sector can be profitable and prosperous,” said LePage. He also talked about the need to improve the educational system in Maine, in particular, to provide educated workers with the skills companies need. One of the problems, he said, is that too many students are aimed at college, when some should instead be pointed toward vocational studies. LePage pointed to a briefing he just received on $7 million in federal money given to the state to grow jobs through work force skills development. Less than $1 million went to actual training, he said, with the rest going to salaries and overhead for administration of the grant. “That is almost criminal,” he said. LePage Press Secretary Adrienne Bennett said later in the day that the governor was referring to federal money sent to the state’s four Local Workforce Investment Boards through the U.S. Workforce Investment Act. In 2010, she said, $5.6 million went to support staffing, overhead and administration at the four boards, while $840,000 went to training. In 2009, she said, $5.3 million was spent on overhead, staffing and administration, and $1.2 million was spent on training. Bennett said her boss met with Workforce Investment Board members Thursday to learn more.